From left: John Ward; John's wife Dorothy (photo contributor); Dorothy's sister Lois; Eleanor Ward; Kenneth Ward. 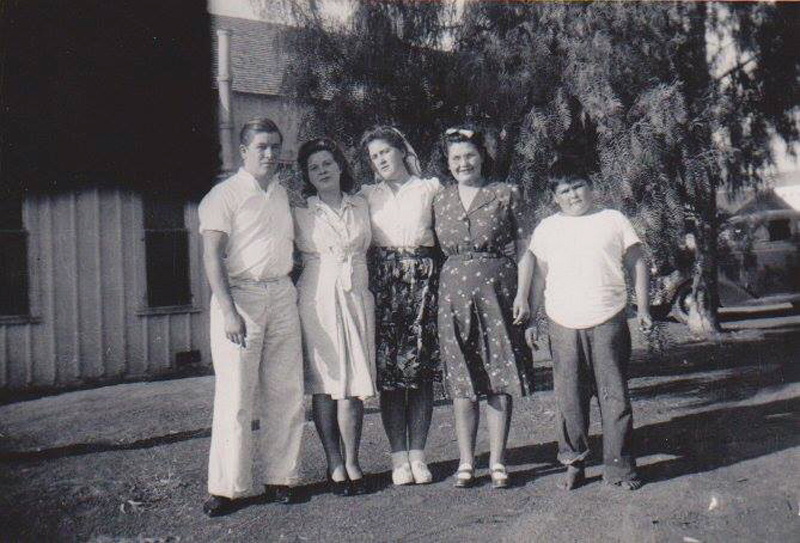 Photo shot in 1939 on 7th Street in Escondido, Calif.
John (d. 1945), along with Eleanor and Kenneth, are children of Margaret Rivera (Ward) and Eldgridge Ward. Through Margaret (b. 1899), their ancestry is traceable to individuals who lived at Chaguayabit (aka Tsawayung), a Tataviam Indian village at Castaic Junction, as well as Topipabit village in the Victorville area, prior to European contact in 1769. WD4501: 19200 dpi jpeg from smaller jpeg courtesy of Dorothy Ward | Online image only.